Hundreds of Ithaca College students and supporters gathered at the center of campus Wednesday to demand the resignation of college president Tom Rochon and an overhaul of the structures at the campus that they said make students of color feel unsafe and excluded. The protest, which began around 1:30 p.m. and attracted at least 750 people, was in response to what organizers said were a series of incidents that demonstrated cultural insensitivity and exclusion of certain groups. 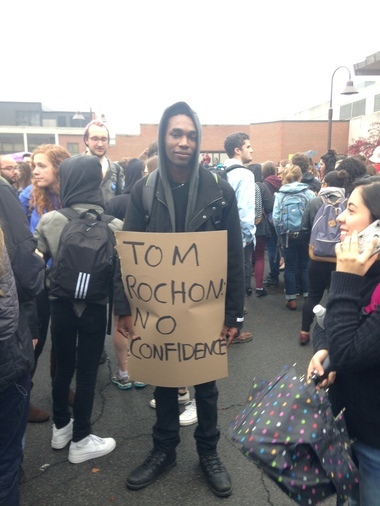 The demonstration, organized by the group People of Color at Ithaca College, featured chants of “Tom Rochon! No confidence” and a die-in, where students and protesters lay on a main campus thoroughfare in hopes of drawing the attention of students moving between classes.